When designing a large ecommerce site or complex online service, most probably you will be asked to design a system for ordering or configuration online. Guiding users through this process by making it easy and intuitive is key to helping increase conversion rates. Any frustration along the way may cause them to leave and pursue other options. 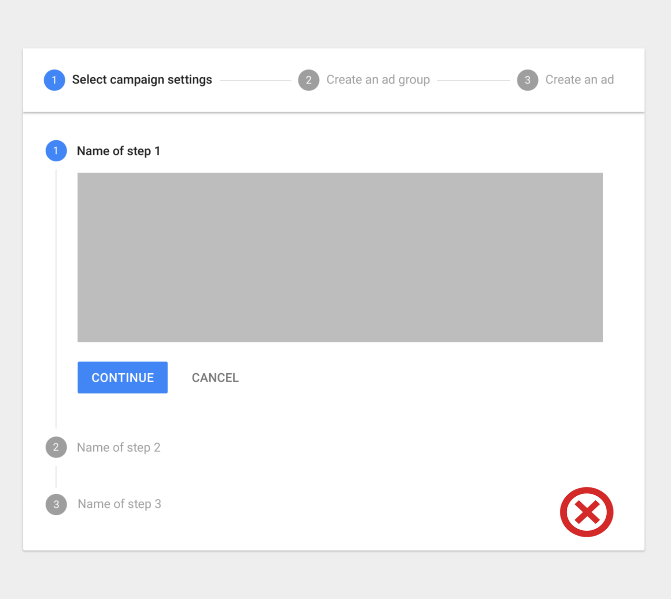 An easy-to-use stepped process helps users avoid frustration and successfully complete a primary task. In this article we will overview various uses of progress trackers and see how they can be implemented. Current step they are on (user’s current location within the process). Which and how many steps still remain (preferably with clear designation). Progress Trackers convey progress through numbered steps. Progress trackers create a clear path to completion. Studies show that offering users a clear idea of how many steps it takes to get to the final target can significantly reduce abandonment. From the psychological point of view, this makes a lot of sense. If you know how many steps you must complete in the process, you’re more likely to complete the process. Create account as a multi-step action. Also presenting content in chunks makes scanning easier for users and can improve their ability to comprehend. In practice, chunking is about creating meaningful, visually distinct content units that make sense in the context of the larger whole. Progress trackers can be used in a variety of contexts. The following three areas are the most common. By far the most common use-case of progress trackers is in conjunction with online purchasing, since this task can be naturally split up into multiple steps. If a form requires a lot of user input, it may be good to split the form into multiple steps. Progress trackers are also used to guide users through the features of apps and services. You can use dots when the number of steps isn’t large (like in Dropbox example below). There are no universal solution for creating excellent progress trackers. But one thing for sure — you should always think of how your users interact with the system. Generally speaking, you should design process steps as simple and clear as possible in order not to confuse users. When a user is going to take on a complicated process, it is important to manage their expectations up front and tell them how much time and effort it will take. If the user thinks the task will take two minutes, but in reality it takes ten, the user won’t have a positive experience. Providing a description of the process will help users prepare for a more complicated task. Its also a good idea to give an estimate of how long the task takes to complete, especially when the steps don’t map one to one (e.g. some steps are longer than others). Use icons in conjunction with words to describe the steps in the process. It should be clear for users what step sequence. Don’t make the process too long. 3–5 steps will be enough. “Where am I?” is one of the fundamental questions users need to answer to successfully navigate. That’s why a key aspect of good progress tracker design is keeping the user informed of where the user is within the process. This improves the logical progression because the users will know where they are in relation to where they have been, and what sections are to follow next. You should offer a good visual representation of progress. Users rely on visual cues from navigation elements to answer this critical question. Use a clear change of state, not just a change of color to indicate which step the user is on. Proper icons and text labels that help users understand the menu options can aid comprehension. Avoid using steppers multiple times on one page or embed progress trackers within progress trackers. They can create a mess in your UI. Progress trackers may display a transient feedback message after a step is saved. This feedback should only be used if there is a long latency between steps. This progress indicator displays a transient feedback message after a step is saved. Since horizontal space is usually limited, a vertical progress tracker might be good solution for mobile apps and sites. Simply ensure the contents for each step are responsive. Vertical steppers are designed for narrow screen sizes. Design progress trackers to be easy, understandable and unobtrusive and don’t forget about their visual appearance that also should attract and guide users visually. Think “users first.” Remember that we aren’t designing for designers. We are designing for our users. Ultimately, good progress trackers can make users stick around to finish the task and generally have a more positive impression of your site or application.